Discover Banyan Tree Spa Sanctuary’s bespoke wellness retreat and start the New Year in ultimate bliss. On the tranquil shores of Phuket’s Bang Tao Bay, the boutique, adults-only resort sits secluded and enshrined by exotic gardens. With only 12 unique villas available, guests will find themselves surrounded by peaceful lily ponds, with spacious master bedroom villas adorned in pure Thai silks, setting the scene for the ultimate relaxation. Designed to provide a sanctuary for the senses, enlivening the soul and relaxing the body and the mind, guests can tailor their very own wellness plan to suit their personal goals and improve their overall wellbeing. There are also unlimited wellbeing activities available everyday for guests including yoga and pilates classes held by Banyan Tree’s in-house experts, seaside treks and sound meditation classes. 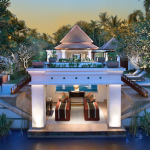 Included in each guests bespoke package is Banyan Tree Spa Sanctuary’s wellness menu. Serving up a delicious selection of organic dishes with a focus on clean recipes, each meal is carefully designed to nourish the body and the mind. Travellers will also have the luxury of choosing from the resort’s six restaurants and two bars serving the finest food and beverages, or for a more private experience in-villa dining is also available. Waste no more time and kick off 2019 in ultimate bliss with a personalised experience at leading boutique wellness retreat Banyan Tree Spa Sanctuary.